The Magic Continues as FM Muhammad earns 2nd IM norm! Five years ago, FM Stephen Muhammad had the tournament of his life by scoring 6 points and a 2647 performance rating. The World Open has been particularly good to the Columbus-based chess instructor and he has made a habit of upsetting the pairings with numerous scalps. The 2002 World Open was no different. FM Muhammad not only had a 2634 performance rating, but won 1st under 2400 and earned his 2nd IM norm!! 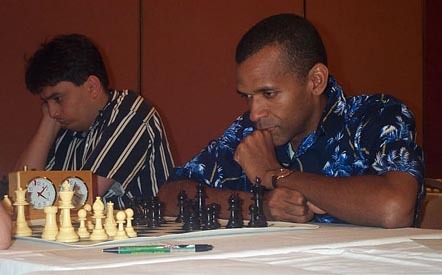 Having already qualified for the 2003 U.S. Championship, FM Muhammad has been focused on earning the necessary norms for the IM title. He now joins his friend FM William Morrison and NM Norman Rogers as the holder of two IM norms; three are required to gain the coveted title. Here is an account of FM Muhammad's progress to the IM norm. Round 1: Nick Faulks (2071)-Muhammad, 0-1. Round 2: Muhammad-Joshua Bakker (1980), 1-0. Round 3: IM Igor Zugic (2471)-Muhammad, ½-½. Round 4: Muhammad-IM Alex Kalikshteyn (2424), ½-½. Round 5: GM Gennadi Zaitshik (2578)-Muhammad, ½-½. Round 6: Muhammad-IM Eugene Perelshteyn (2515), 1-0. Round 7: GM Yury Shulman (2616)-Muhammad, 1-0. Round 8: Muhammad-IM Justin Sarkar (2435), 1-0. Round 9: GM Julio J Becerra (2606)-Muhammad, 0-1. 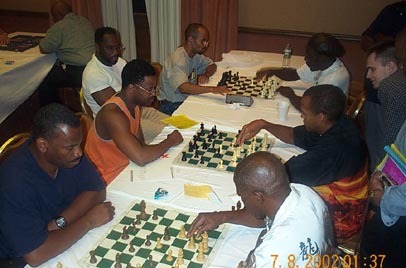 FM Stephen Muhammad (right center) showing GM Maurice Ashley his game against IM Eugene Perelshteyn. Both Muhammad and Ashley have qualified for the 2003 U.S. Championship.